A high wheel bicycle (also known as a penny farthing, high wheeler and ordinary) is a type of bicycle with a large front wheel and a much smaller rear wheel that was popular in the 1880s. The first Penny farthing was invented in 1871 by British engineer, James Starley. The Penny Farthing came after the development of the 'Hobbyhorse', and the French 'Velocipede' or 'Boneshaker', all versions of early bikes. However, the Penny Farthing was the first really efficient bicycle, consisting of a small rear wheel and large front wheel pivoting on a simple tubular frame with tires of rubber. 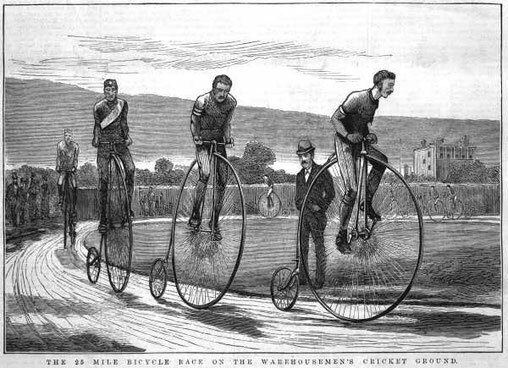 Although high wheel races were common in the 19th Century, there are only four races of this kind that now occur around the world. 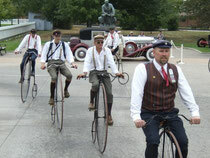 The Wheelmen embrace a broad range of bicycle-related activities, centered on the historical aspects of cycling. Such activities include riding in parades, tours and demonstrations, holding rides, participating in events to promote modern cycling, displaying bikes and memorabilia, research, writing and publishing cycle history, collecting bicycle literature and memorabilia, restoring cycles, restoring and recreating uniforms and costumes, recreating grand dance balls, picnics, developing buglers, show and tell meets, swap meets, auctions, slide shows, visiting historic sites and museums, and learning trick riding. Collectors and restorers have salvaged thousands of antique bicycles and preserved large quantities of bicycle memorabilia, literature and other valuable materials of the golden era of cycling. Many Wheelmen have built outstanding collections of cycles that rival the best of museums. For more information regarding the Wheelmen and how to become a member, please visit The Wheelmen Homepage.